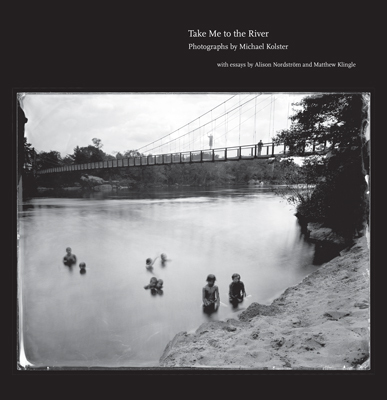 Book Review Take Me to the River By Michael Kolster Reviewed by Blake Andrews You can't step into the same river twice" the old saying goes. Photographer Michael Kolster might beg to differ. Supported by a 2013 Guggenheim, he's spent the past few years stepping into and around the same four rivers along America's Atlantic Coast. Take Me to the River: Photographs of Atlantic Rivers. By Michael Kolster. George F Thompson, 2016. Photographs by Michael Kolster. Text by Alison Nordström and Matthew Klingle. George F Thompson Publishing, Staunton, USA, 2016. 240 pp., black-and-white illustrations. "You can't step into the same river twice" the old saying goes. Photographer Michael Kolster might beg to differ. Supported by a 2013 Guggenheim, he's spent the past few years stepping into and around the same four rivers along America's Atlantic Coast. With each river — north to south they are the Androscoggin, Schuylkill, James, and Savannah Rivers — he applied roughly the same treatment. He began at the mountain headwaters and proceeded to the industrial mouth, making images from the shoreline along the way. One hundred of the resulting photographs are collected in the handsome new book Take Me To The River published by George F. Thompson. Kolster employed the ambrotype process for his photographs, a technique that had its brief heyday more than 150 years ago. For those needing a quick refresher, an ambrotype's emulsion is made of liquid collodion poured over a large glass plate, which must be developed and fixed on-site quickly after exposure. This choice of medium injects more limitations than most — site accessibility, exposure duration, and material flaws must all be accounted for — and these factors become integral to the resulting images. Photographers accustomed to digital convenience might consider the entire thing a pain. But for an enthusiast like Kolster, ambrotypes represent "photography at its most physical and sensuous." Take Me to the River: Photographs of Atlantic Rivers. By Michael Kolster. George F Thompson, 2016. In Kolster's experienced hands, the photographic process takes front and center. Blips, blurs, and specks litter the images. But these markings are well controlled and rarely detract from the subject matter. On the contrary, in several of the more successful images, Kolster masterfully references the time-lapsed streaks of flowing rivers with the collodion itself. "The visible residue of the chemical slurries I coaxed across their surfaces corresponded to the dynamic, shifting character of the rivers," he explains in the forward. Static shots of Worumbo Dam in Maine and a bridge in Philadelphia, in particular, exemplify a deft combination of effects. But all of the images exhibit the timeworn character of cherished heirlooms. The choice of ambrotype and its inherent retreat from objectivity raises photography's perennial dichotomy: the photograph as an external document vs. the photograph as internal expression. In John Szarkowski's well-known argument, the division is between "windows" and "mirrors." Don't expect the question to be settled any time soon, and not in this book. But it assumes a central role in Kolster's images. Kolster is well versed in the subject — it may well have motivated his choice of material — and wades quickly into the fray in his introduction, delving into Szarkowski's 1978 essay before finally straddling a philosophical middle gray: "The images… are quite literally both window and mirror." If Kolster's explanation leaves the issue unsettled, Alison Nordstrom’s essay, also in the book, provides a bit more guidance. By framing Kolster's river photos in historical context — with supporting examples by Daguerre, Fox Talbot, and O'Sullivan — she seems to favor their importance as scientific documents. The structure of the book also fosters this view. Each river's chapter is introduced with a diagram and statistical background, followed by a sequence of photographs progressing downstream to describe a loose geographic narrative. For those seeking pure information about these four rivers, the book is a reference manual of sorts. The meat of Take Me To The River is, of course, the photographs themselves. Presented dramatically with dreamy bright orthochromatic skies, they look quite beautiful in this large scale book. Kolster photographed from a variety of perspectives with varying amounts of human influence. Some images show Edenic natural settings. Some — generally downstream — are quite industrial. A few show actual humans, blurred toward indistinction by the slow exposure process. The range of expressions that a single river can take on is quite extraordinary. One of Kolster's favorite techniques is to combine several photographs of a site horizontally into a panoramic sequence. Sometimes these are contained in one spread. In a few dramatic cases they sweep beyond the page into an extra gatefold. When laid on the book's black satin pages, these multi-image panels give the effect of peering out a — Szarkowski's? — window. Kolster's photographs bear more than a whiff of environmentalism. With deadpan translations of industrial effects, they recall the social commentary of New Topographics; yet Kolster's are less wry and are given a romanticized twist. Whether that feeling is due to the chosen viewpoints or the use of an antiquated process is hard to untangle. In any case, Kolster's nostalgia for healthy rivers comes through both in the photos and in his introduction. When he writes "I am struck by how quickly and profoundly these rivers change day by day and over the course of decades," one can't help but wonder if he rues the human impact. But of course, rivers change on their own too.